√ Restaurant info - We don't get paid to send you! Interested in a website? Cabo Internet Services will gladly help. Bet you had no idea how cheap & easy it is? Domain names are easily searched and inexpensively registered through Fish Dog Domains. Fast & Easy!! We also donate to the Los Cabos Humane Society, with every domain name registered for every year, is $1. We hope you will too!? It's a great cause! 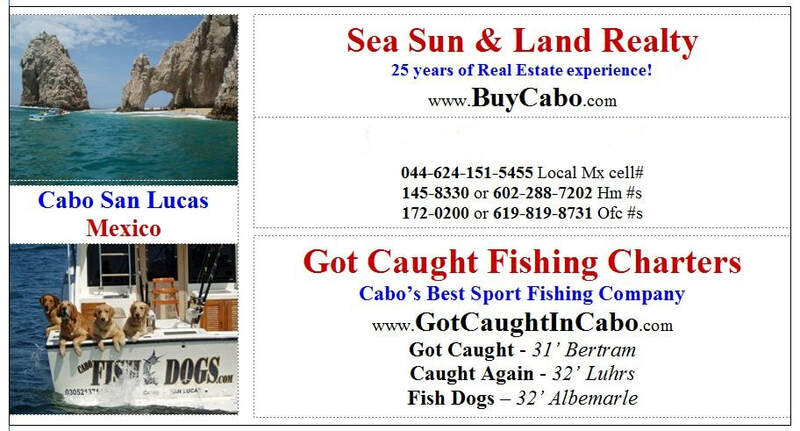 Cabo's Real Estate company of choice is Sea Sun & Land Realty & Development. Consider them the ONLY Name YOU NEED to KNOW in Real Estate. Knowledge, Honesty & Integrity coupled with 25 years of experience with Todd. Got Caught Fishing Charters - American owned & managed charter fishing company, A.K.A. Cabo Fish Dogs. Architect / Contractor / Marble & Granite Sales specializing in Kitchens, Baths, remodels/additions, Granite, Tile & more, Susana Diaz. Low overhead & very good prices on projects. Material sales, too, if that's all you Need / Want? US & Canadian long distance phone calls & services, for cheap and even FREE! Satellite TV systems - Offering US, Canadian & Mexican satellite TV services, by Cabo Satellite. Contact Damian. Los Cabos Humane Society - Donate money, time or both as well as attend locally LCHS sponsored events. Sea Sun & Land Real Estate & Development - Mexican real estate with American standards, ethics, & practices you can trust. Fish Dog Domains - Register your internet domain(s) CHEAP & Easily. Cabo Internet - Very nice, but Inexpensive websites set up for businesses and/or personal use. 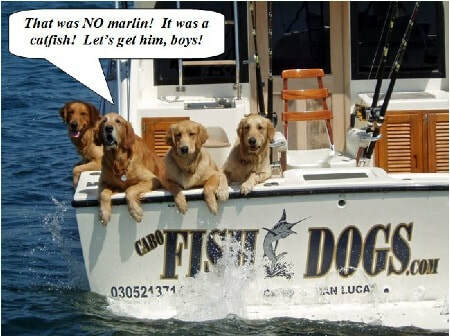 Cabo Golden Retrievers site - Our very own site about the famous Cabo Fish Dogs and their families & so much more! Susana Diaz, Architect - Cabo stone, tile, granite, tables & more SALES as well as remodeling. 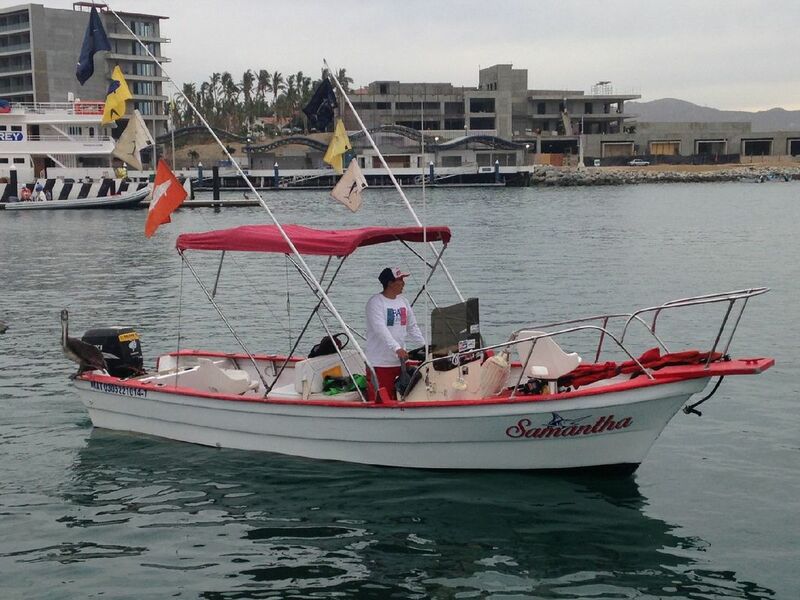 Cabo Panga Fishing - Smaller in-shore style fishing from center console style boats for 1-2 anglers. 602-288-7202 US#, 044-624-151-5455 Mx cell#, 011-52-1-624-151-5455 Mx cell# from USA & Canada. BC Consulting - Cabo real estate attorney specializing in closings, as well as other general real estate matters. Los Barriles Restaurant - Great restaurant to take your fish to have prepared! No FISH, No problem. They have great dinners. Say hello to Francisco (Poncho) for the dogs! Awesome place to take you fresh fish for them to cook! Excellent & great price! Misiones de Kino Restaurant - Another favorite restaurant in Cabo. Take your fish or not, wonderful outdoor atmosphere! You'll love it! Located on Hidalgo St about 2 blocks north of the marina Blvd. Another awesome restaurant, great for taking fish! Tell Israel hello for us, too! La Golondrina Restaurant - Formally 1 of the 2 ORIGINAL Trailer Park Restaurants, it's the sole survivor and easy to know why? AWESOME!!! Baja Brewery - 1st local brewery in Cabo. 1 brewery location in San Jose (centro) & 2 more restaurant locations with their beer in Cabo San Lucas (top of Cabo Villas & on marina in Puerto Paraiso Mall). Villa Serena Subdivision - Cabo San Lucas ocean front community! It has it all, Restaurant, Secluded beach, RV Park, MORE! Everything u need is here! Cabo Handyman Services - You name it, electrical, plumbing, roofing, painting, landscaping, maintenance issues, MORE. We bring these businesses to you and hope that you will use them, as we do. Thx and have a great day.